Friday January 8th 1892 It was a very cold day. We got ironing and baking done in the forenoon. I was knitting most of my spare time. We did not hear how the girls were today. Saturday January 9th 1892 We were busy all morning. Edith came over for dinner and rode back to town with us in the Surry. We did not stay over late. I finished the lace for my skirt tonight. It has been a cold day. Sunday January 10th 1892 I was busy about the work all forenoon and read in the afternoon. In the evening I wrote some while Will went over to Woolfs. We heard the girls are better today. Monday January 11th 1892 It was a cold day. I suffered a great deal with that trouble I so often have with my stomach. I knit a little but went to bed early in the evening. Tuesday January 12th 1892 It is still cold. I feel better then yesterday and put in my spare time at knitting on Wills socks. Wednesday January 13th 1892 Weather more moderate. We got our washing done by eleven oclock and Father and Mother went to town. I knit a little and done some mending for Will. He went after the folks in the big sled in the evening. Thursday Jabnuary 14th 1892 After we got the work done up Father & Mother went to town. I had a letter from Jim Mason this morning announcing the birth of a boy to them on yesterday. I answered the letter and wrote to Charlie. I knit what time I had to spare. 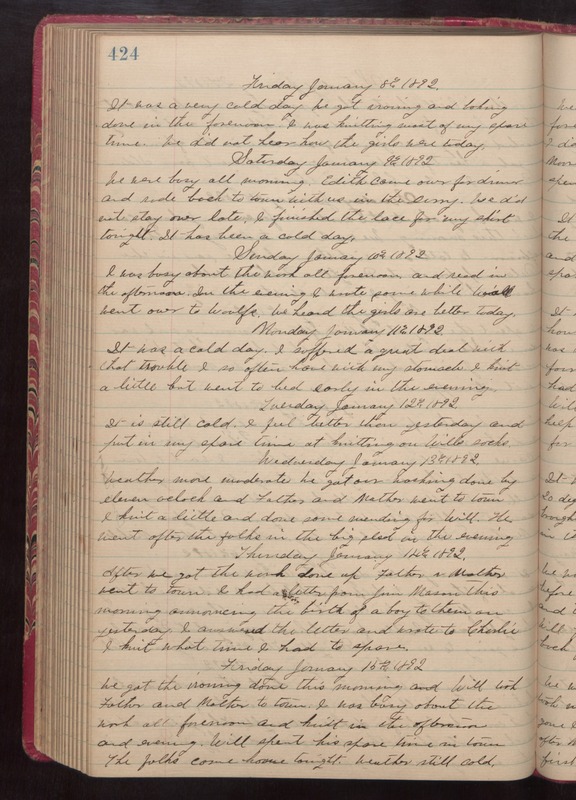 Friday January 15th 1892 We got the ironing done this morning and Will took Father and Mother to town. I was busy about the work all forenoon and knit in the afternoon and evening. Will spent his spare time in town. The folks came home tonight. weather still cold.